I needed some new end mills as I managed ot break an 8mm one last week – quite frankly I was being heavy handed and had not tightened up some of the traverses as well as I should have. I went online to one of the regular places that I purchase this sort of tooling from arceurotrade.co.uk and saw that they were selling TiN coated end mills at around £2.50 each. TiN is the chemical abbreviation for Titanium Nitride, a hard ceramic material that is added as a coating to high speed steel to improve wear resistance, for edge retention and corrosion resistance on machine tools. I′ve been machining a bearing block for my beam engine, a phosphor bronze casting and must admit that it wasn′t going that well. I was using one of my old end mill bits and it really did feel like the edge had gone. I swapped the end mill for one of the new ones I had just received, 6mm with a 6mm shaft. You can just see the end of the collet with it held in the mill. The change in the cutting performance was quite frankly remarkable with me being able to double the depth of cut and increase the feed rate. In addition the finish looked much better. OK, some of this was just down to the fact that it was a new sharp end mill, but do think that TiN coating improved the cutting performance. 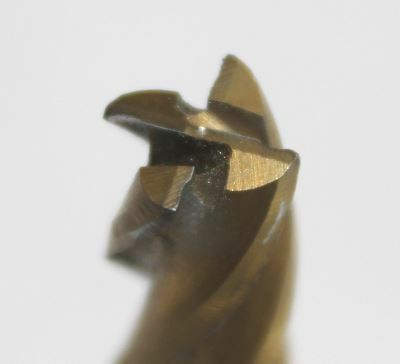 Great price and must admit that I wouldn′t buy any milling bits without the TiN coating. 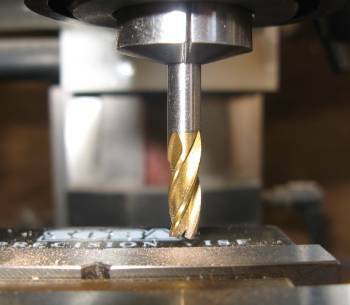 This is an end mill that has had some use on steel and aluminium and you can clearly see the rounding of the edges. These end mills are widely available from many different online retailers in the UK and are at a very low price and so be prepared to replace them quite regularly. Since writing this review I have found that Dormer end mills purchased on eBay are just amazing in terms of quality and effortless cutting. 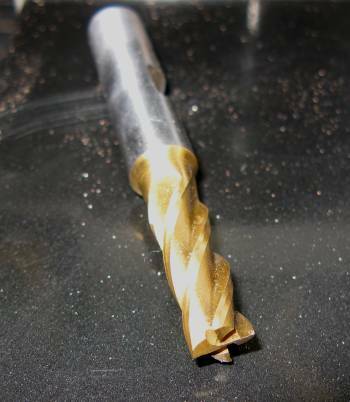 Also, the solid carbide slot drills with TiAlN coating are very impressive in terms of the edge they are able to hold, high speed capability based on higher temperature that they can withstand and as a result the fantastic finish that you get as a result – e.g. 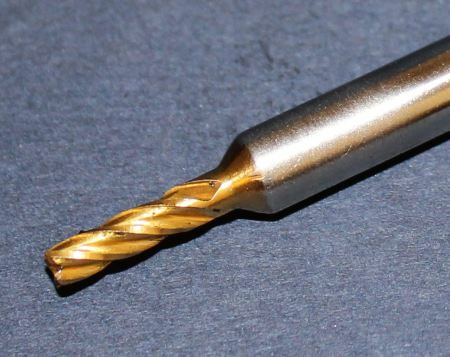 Rennie Tools Carbide Slot Drill. I’ll offer a suggestion about endmills. I’m briefly familiar with your work, from submissions appearing on homemadetools.net. This time, your lathe carriage stop project brought me. Also having a good time bouncing around Glue-it site this Sunday morning. Our scope of expertise [thanks to the internet] is so vast now, I’d warrant the multiplication incalculable. There is no way to envision how else like minds could interact a few dozen, let alone thousands of miles apart. I happen to be a short distance from calculated center of USA. Drawing attention to the TiN endmill; though perhaps the pic is staged for convenience. You’ll greatly extend performance gripping the shank closer to the reliefs. Regardless condition of spindle bearings, shortening unsupported distance twixt cutting action and bearings reduces nodding ‘orbit’ of the cutters centerline. Smaller the endmill, greater the benefit. Increased diameter [vs. length] add strength in not exactly linear progression, as percentage of chip clearance increases at a different rate. I welcome any exchange of techniques we might enjoy in the future!